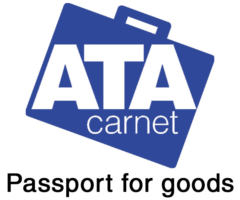 ATA Carnet stands for Admission Temporaire/ Temporary Admission. It is a document that can be used to temporarily import and export goods without the need for a customs declaration. The major advantage of an ATA Carnet is that you don’t have to pay a deposit in the country of temporary importation. This includes import duties and other country-specific taxes. The amount of VAT to be paid remains out of sight. The ATA Carnet can be used for the countries affiliated to the ATA Convention. A country has the ability to conclude three separate conventions; trade samples, exhibition goods and professional materials. The full text of the ATA Convention can be found on overheid.nl /English version. How to request an ATA Carnet? For a number of years, the application of an ATA Carnet has been submitted electronically. In the Netherlands, the Chamber of Commerce has the authority providing the ATA Carnet. To be able to request an ATA Carnet, you need to create an account at www.kvk.nl/ata. Requesting an ATA Carnet takes about 3-5 business days. 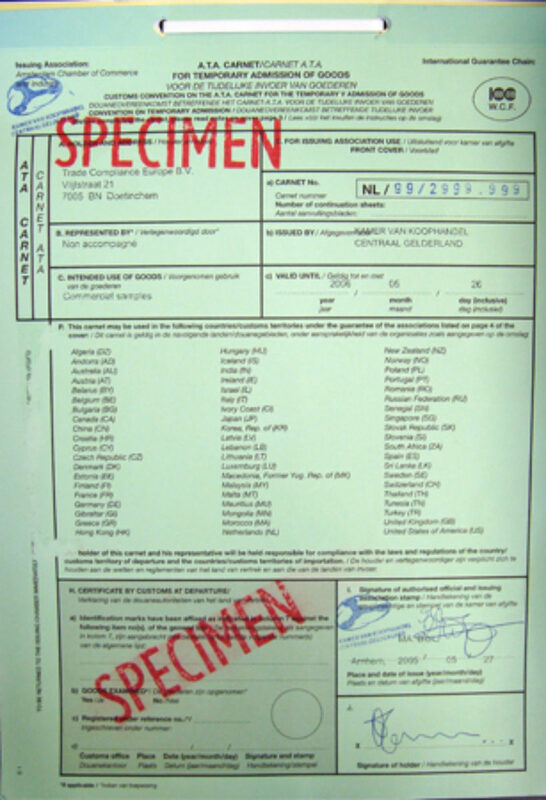 The cost of an ATA Carnet amounts to €199.00 administration fee plus additional costs which among others depend on the value of the goods listed on the Carnet. Before making an application please check if the purpose for which you need the ATA Carnet is possible in the destination country. For example, in the United States, it is not allowed to enter goods on an ATA Carnet when visiting an exhibition, unlike the United Arab Emirates where visiting an exhibition is the only option to use an ATA Carnet. In addition, a country may require that Customs has to be notified in advance about the use of the ATA Carnet before the goods arrive in this country or that there must be permission before acceptance is possible. Another possible situation is that the name of the exhibition must be stated and specified in an additional letter. So please keep in mind that sometimes additional national legislation applies. As a result of the Brexit, the ATA Carnet might become an attractive export document for temporary import and export to the UK? Yes, although everything depends on the correct use of the ATA Carnet. An ATA Carnet can be used unlimited for 1 calendar year (12 months). However, the customs of the importing country may indicate a date on the ATA Carnet on which the goods must be re-exported. This date is leading in that case and not the validity period of 12 months. 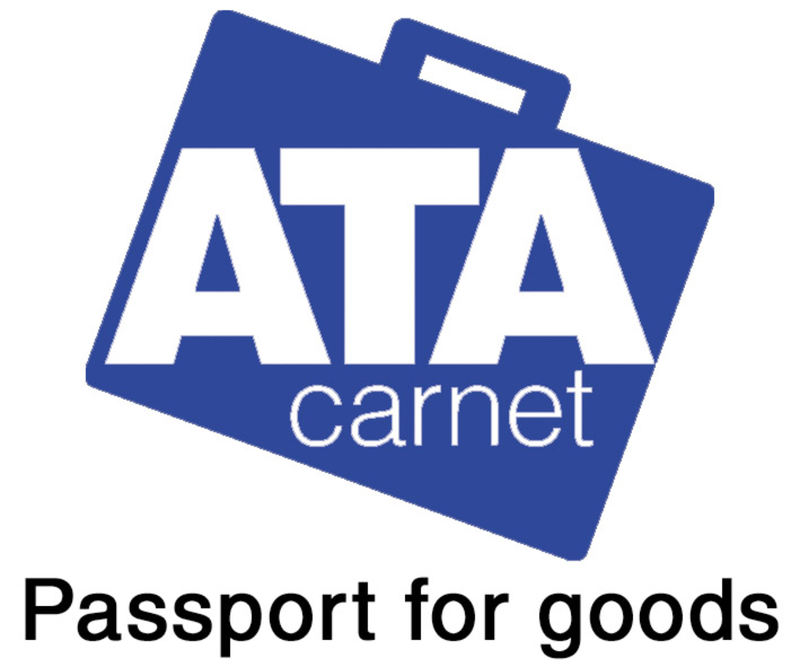 It is possible to use the ATA carnet for multiple trips, for several destinations, during these twelve months. 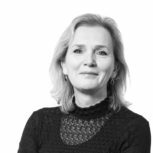 For example, Company X regularly performs repairs to products sold to companies established outside the EU. The mechanic has a wide range of tools but does not have to bring everything with every effort. This depends of the job. Company X could request an ATA Carnet which states a list of goods containing all tools that are used by the repair activities. This list needs to be complete at time of the request for the ATA Carnet and cannot be adjusted after the carnet is issued. For each trip, the mechanic (or a colleague) can indicate which material of tools are needed and will be travelling with the ATA Carnet. 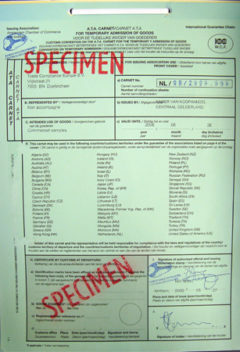 The ATA Carnet is intended to remain with the goods. In the example of the mechanic, it remains in the possession of this person and the tools. The success of the ATA Carnet depends on the correct collection of stamps at the various customs offices. Deviating from the correct procedures almost always causes problems. As an example; the customs office on the Swiss border is closed on the way back, and the driver decides to drive through without collecting the stamp. Incorrect use and timely delivery of the correct stamps ensures that shipments (temporary import and export) remain open to customs. If there is no alternative way of proving that the goods have left the country concerned, there will be a fine and levy of all possible taxes and duties, which may be substantial amounts. Good instruction and preparation is half the work as always and will definitely make a success of your use of an ATA Carnet. In short, good instruction and preparation can make the use of an ATA Carnet a success and ensure you enjoy many benefits!